Those of you familiar with the original "Zoolander" movie will remember that at the film's end, the lovably dense super model fulfilled a big dream to give back to the world by opening The Derek Zoolander Center for Kids Who Can't Read Good. But even before his sequel debuts, he's already expanded on his "philanthropic" pursuits by teaming with Kiehls to unveil DZCFPWDAG, or, the Derek Zoolander Center for People Who Don't Age Good. 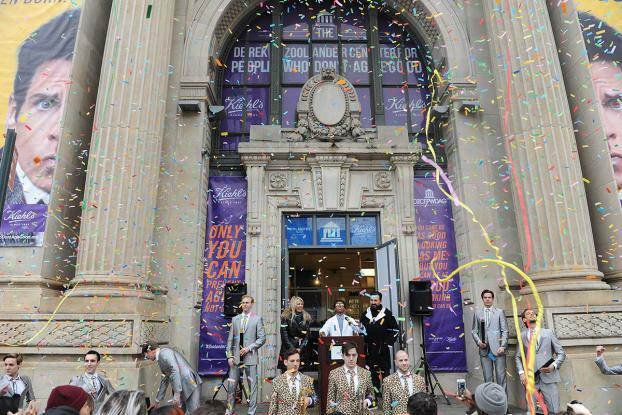 The center opened with much fanfare in New York City this week, with an ambitious event featuring an army of "ridiculously good-looking" male models wearing silver suits and piano key neckties. Razor scooters (like that his pal Hanson rode in the first film), trumpets and drones were also part of the show. After the grand introduction, guests walked along a leopard-print carpet and into the center, where spokesmodels introduced them to Zoolander and Kiehls' "6.5 step youthification program." The DZCFPWDAG will be open to the public through Saturday, February 13th. More information can be found at http://thederekzoolandercenterforpeoplewhodontagegood.org/. Paramount has pulled out all the stops to promote the film. Just this week, it launched a universal takeover on NBC Universal's TV networks, along with a hilarious PSA. Ben Stiller also posed as his character on the cover of Vogue, showed us a new form of selfie in a Fiat cross-promotion and last year appeared with Owen Wilson, aka Hanson, on the runway at Paris Fashion Week during the Valentino show.